The key to protecting islands and land borders is to have a strong naval force in place in order to deter others from attempting to take control and that’s exactly the role you take in the Silent Run slot machine as you take charge of a submarine in a battle of ‘super powers’ at sea where defeating the enemies could see you earn up to 250,000 coins as a reward for serving your country! I hope you’re not claustrophobic as you’ll find yourself sweating inside a hot and noisy submarine directing fellow crew members to load up the torpedoes as you analyse the sonar radar and identify enemy battleships which you must fire at until they sink below the surface in the Echo Bonus feature which offers big rewards. 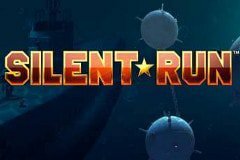 Silent Run is a 5-reeled video slot which contains 25 fixed paylines and with 1p up to £5 allowed to be bet on each line this means that you can jump on board the war machine from 25p up to £125 per spin, and with two types of Wild symbols, a second screen bonus game, and adrenaline pumping sound effects, there are plenty of opportunities to win as you battle it out in the waters for big rewards! There are actually two types of Wild symbols in the Silent Run slot machine – the standard Wild, which functions in the usual way, and an Echo Wild. The Echo Wild appearing on the third reel will see it send out three signals with a red display (whereas the Bonus symbol has a green display) as it searches nearby positions on the reels to identify hidden Wild symbols. A random number of symbols will then be transformed into Wild symbols to help create larger valued winning combinations! It’s all things military on the reels in this dramatic, action-packed slot machine with Net Entertainment designing the reels in a dark and sinister fashion to set the battle scene. The standard Wild symbol is the red warning lights which are positioned all around the submarine and flash brightly with a loud ring blasting out whenever enemies have been identified so that all crew members are alerted to get into position for war. This has typical Wild rules of being able to substitute for all symbols except the Echo Wild and the Bonus. Of the standard symbols it’s the submarine that you travel deep under the surface in with five of these on a payline rewarding the top prize of 1,000 coins. You will also see large enemy battleships on your journey, lots of torpedoes will be fired at them in order to take command of the waters, there are mines which will be planted in specific locations, depth charges which go deep down, plus Ace to 10 icons which have the lowest values of all and have been designed in a metallic style like the metal used to create the weapons of war. Once the Echo Bonus symbol lands on the third reel it will send out sonar signals to detect any torpedoes that are in the water. This means it’s action time as you trigger a second screen bonus feature and you should prepare for a battle as between two and five enemy torpedoes are always identified in the water. The crew will then load up a number of torpedoes on your submarine as you look through the sights to see what enemy ships are in the distance. There will be five enemy ships in view and you’ll have to select one at a time to fire at by taking aim through the scope and witnessing it explode into a ball of flames with a loud blast ringing out before it sinks beneath the surface and you get a cash reward for your success. As you do this you will notice that there is a multiplier ladder below the sight consisting of values worth 1x, 2x, 3x, 5x, and maximum of 10x with you beginning on 1x and the multiplier value increasing to the next value each time you hit an enemy ship, with this continuing until all of your torpedoes have been fired and a congratulatory message is displayed on screen with the total reward for your service! The Silent Run slot machine has been wonderfully designed with detailed symbols which make the war vessels look very realistic and the sound effects really make you feel like you’re in the middle of a battle, however it basically revolves around hoping both types of Echo symbols land on the third reel and the lack of a free spins feature is rather disappointing!